Ageless Storage: Storage that is bought or leased (not Storage as a Service) with upgrades built into the purchase price or leasing terms. 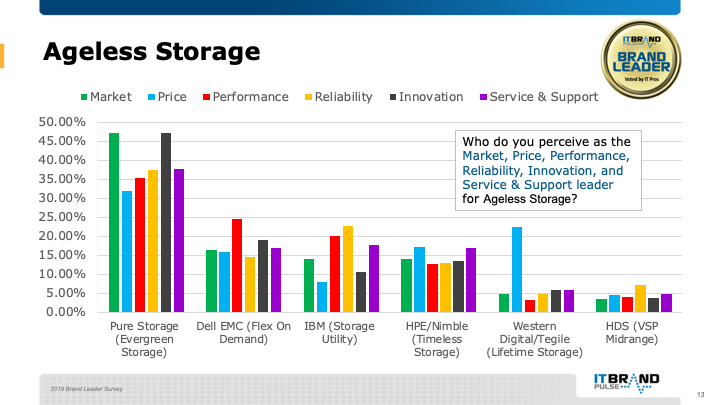 Pure Storage dominated across the board for Ageless Storage; selected by IT Pros as Price, Performance, Reliability, Innovation, Service and Support leader and for the second year in as many surveys, gained the Market leader title. Dell EMC was voted second for Market with IBM following close behind.